Long time lurker but new poster here. I've successfully built my first Tesla Coil following Steve Ward's Mini SSTC5 schematic. Everything is working well, I'm getting nice long streamers and the stock interrupter works perfectly. I have attempted to do some audio interrupting with this SSTC, and I've had some mixed luck with it. 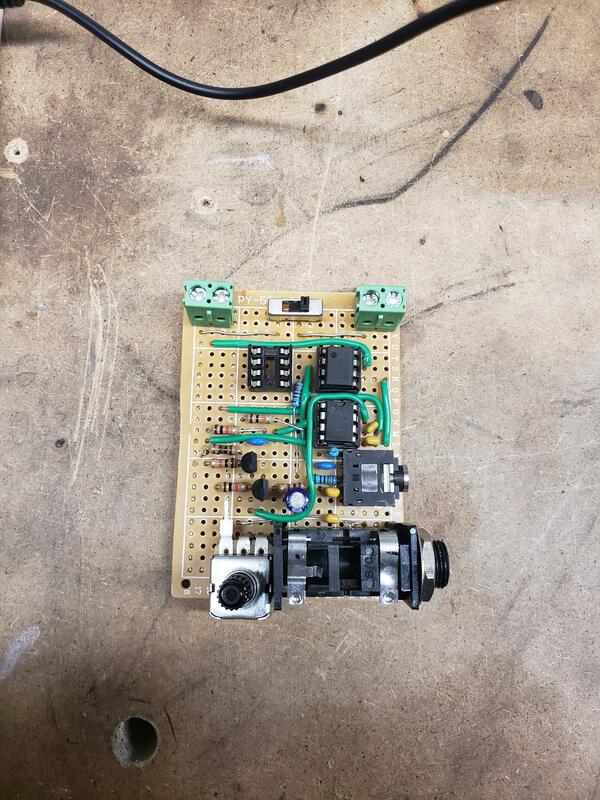 I managed to get an Arduino to interrupt pre-programmed MIDI songs, which works alright, however I would like to be able to interrupt with a mono audio signal, such as from an electric guitar or a smartphone. I had to swap 2 parts out; the LM741 for a UA741CP, which should be alright as it was recommended as a direct replacement on DigiKey. I also had to use 2N3904BU transistors instead of the recommended BC547's, but these were also listed as a direct replacement so it *should* be okay. I've assembled the circuit as shown, twice actually. Soldered one up and left the other on a breadboard. They both have the same result. 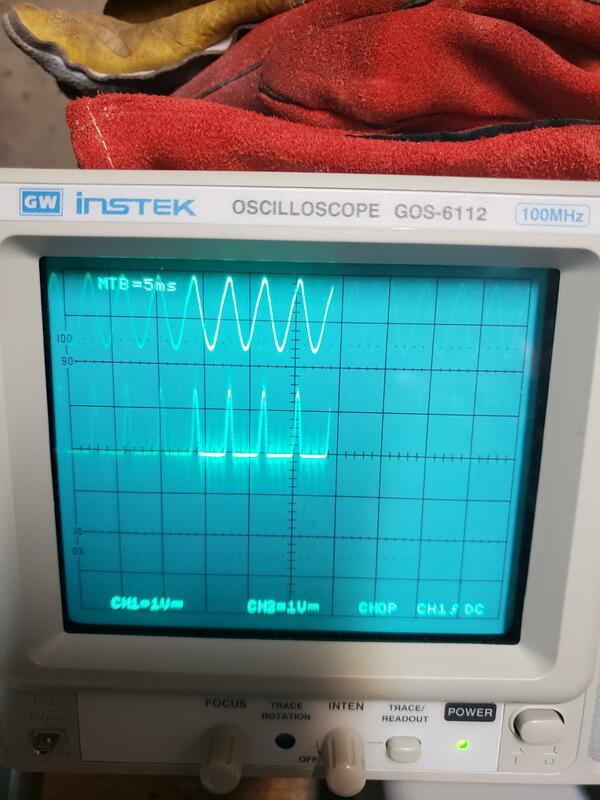 The audio input signal looks great, I can see it on my oscilloscope at around ~1V. 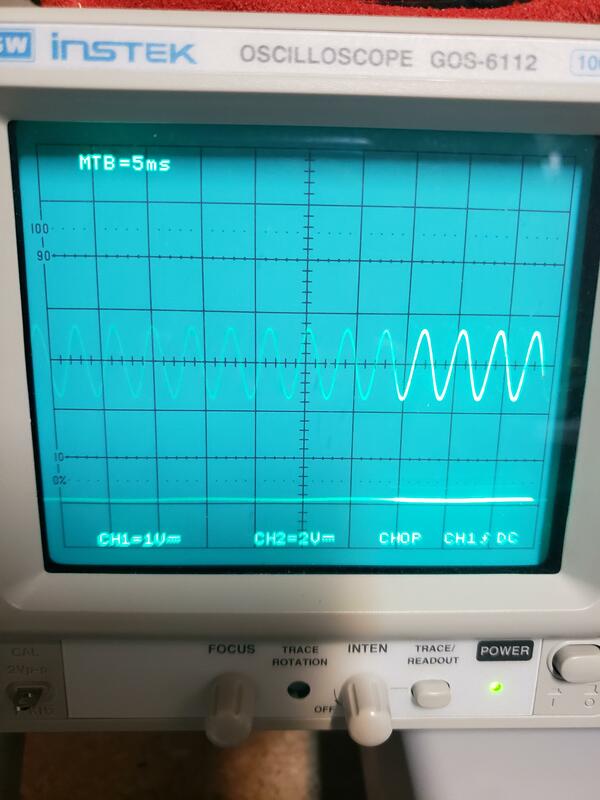 The output from the LM741 doesn't appear to be amplified, if anything it looks like the peaks of the waves are chopped off and there is no negative cycles on the waveform. 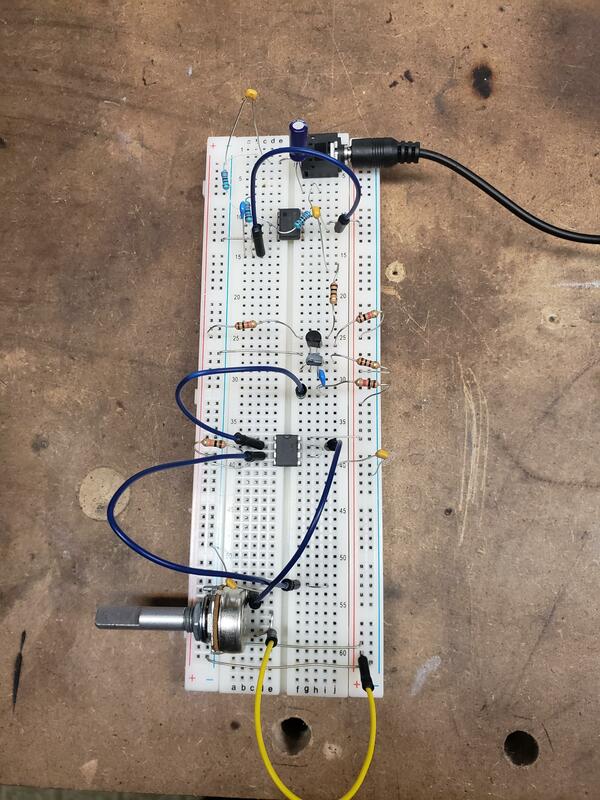 The trigger into the 555 timer, which should be a pulse at the same frequency as the notes, is just held at 12v. The output is also held at 12v. The R14 100R resistor from +9v to the collector of Q6 is also uncomfortably hot, I've actually burned my finger on it a few times. This behaviour is consistent on both the soldered and the breadboarded circuits I've made up. 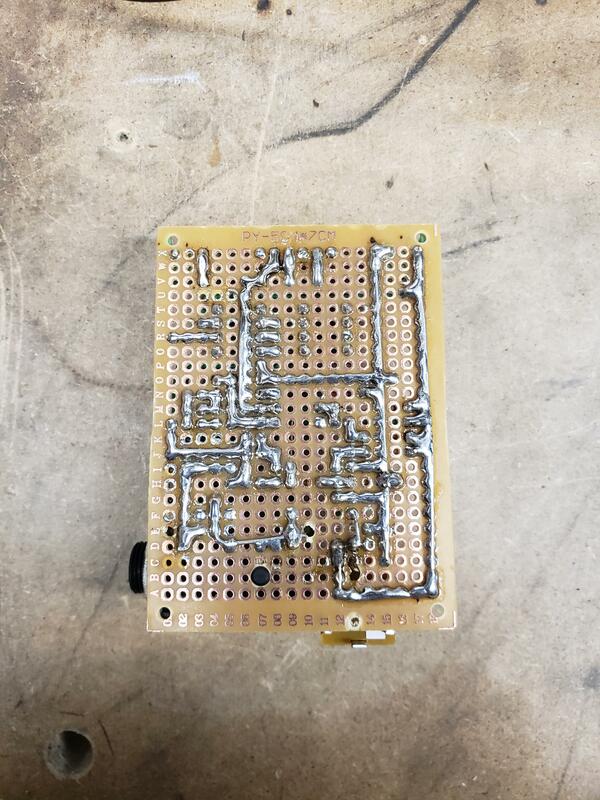 I was also blowing through 555 timers like crazy, but that is unrelated and due to a stupid mistake I made where i was shorting the 9v supply across it. I will try to take some pictures of some waveforms and come back and post them. If anyone has any input as to why this isn't working it would be much appreciated! This is my audio input signal from my smartphone. 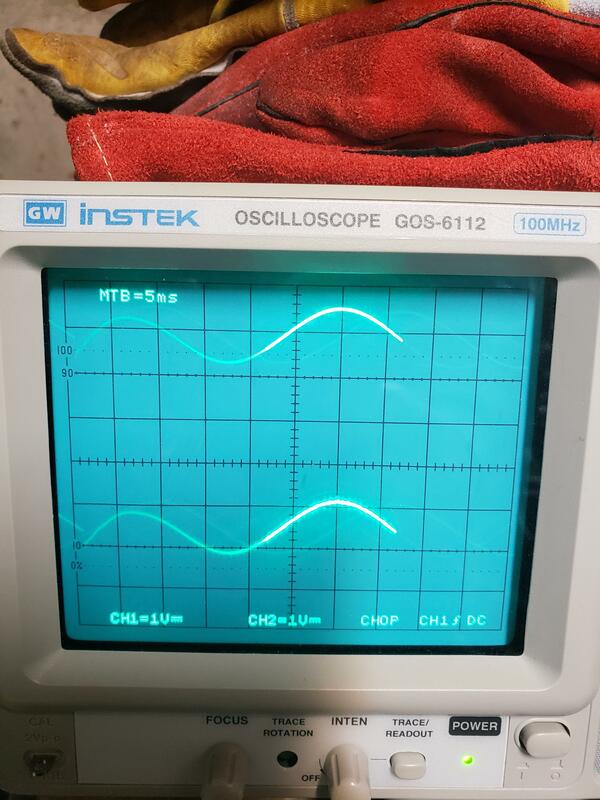 Currently just using varying frequencies of sine waves to test. The waveform is practically flat. I double checked my connections and all wiring to the amp is as shown on the main circuit diagram. As expected, the input to the 555 is incorrect and the output from the 555 is as well. Good eye! Thanks! I had it pulling to ground on the soldered version, just swapped it on the breadboard as well, thanks for noticing. As soon as I swapped it, the breadboard version R14 100R resistor heated up like crazy. Actually burned my finger seeing how hot it was. Any ideas as to why this would be happening? Q6 is pulled high via R13,so the current across R14 will be the supply voltage / R14 .The power dissipation will be this current squared x R14 ,in your case over the 0.25W maximum of the resistor.If no signal is at the Q5 base,it will never turn on to pull Q6 base to ground,decreasing the current across R14. Try using over a 1W resistor for R14 or replace the op amp if that's not working. Thanks for your suggestion! Ill go try a 1W right now. I've already replaced the op-amp a few times, but I have a couple more so I'll swap one in and see if it works, and report back. Thanks everyone for their help so far! Okay! Just tried this out. Replaced the R14 with a 1W resistor of the same value, and swapped in the op amp for a new one. Same issue as before. The now 1W R14 resistor is still getting warm. The circuit is drawing ~120mA. Probed the audio input which is nice and clean, and the input to the op amp is identical to the audio input. 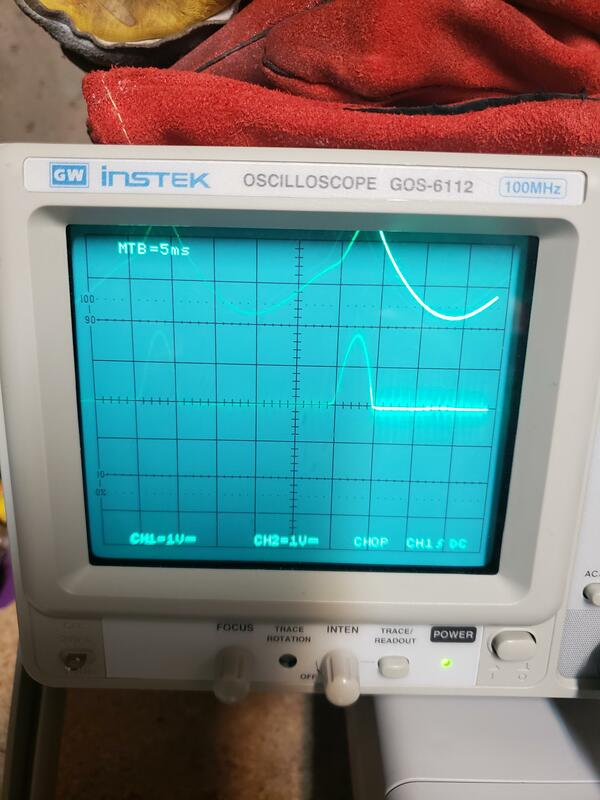 Probing the output (Pin 6 of the op amp) Shows a completely flat line on the scope, with the same settings on the scope. 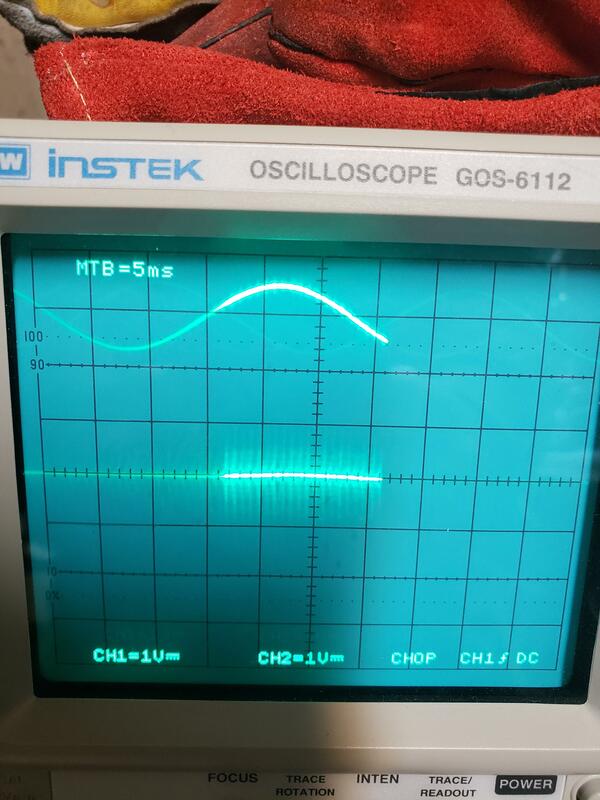 I'm wondering if possibly the op amp isn't liking the supply voltage. 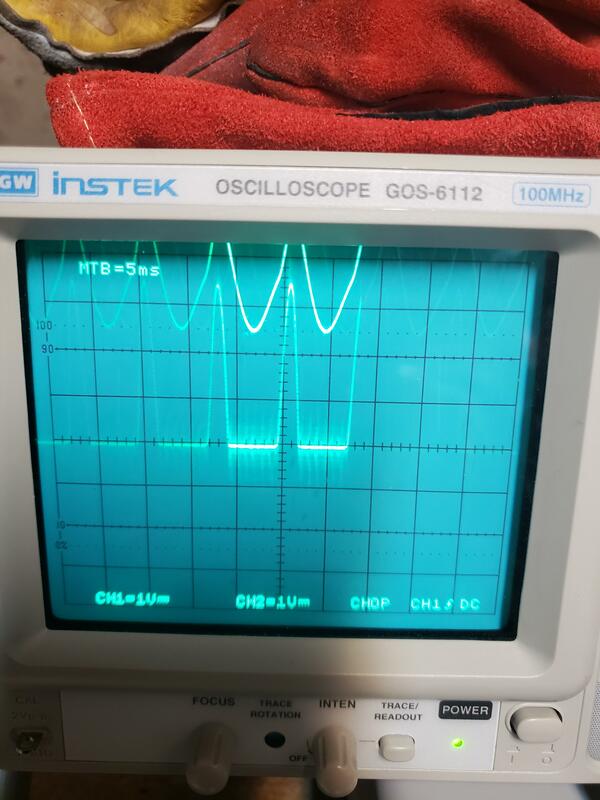 On the datasheet for both the UA741 and the original circuit designed LM741, it shows that you need a positive and negative voltage input, not just positive and GND. I dont think this is the issue though, as the circuit has worked for other users powered off a single 9v battery. He uses a single 9v battery as his power source. I've checked my circuit against his and it all looks alright. He's even using a 1/4W 100R resistor for R14, 1W not needed. Any more suggestions would be appreciated! My full name is Adam Baltazar Mizban. Hello there! 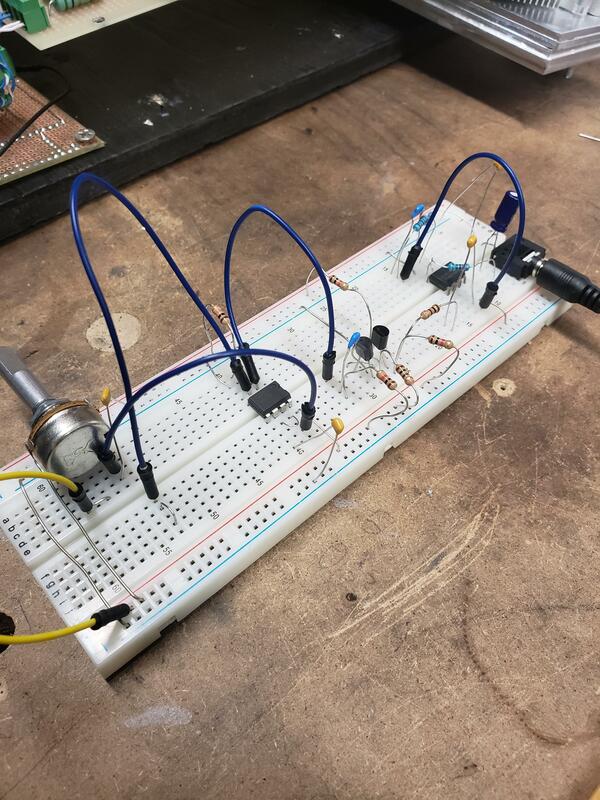 If it helps at all, my op-amp is a UA741CN and my transistors are 2N3904. I was using a 9-volt battery originally, but I switched to using a small dc-dc converter to supply the 9V. The interrupter still works great to this day, however thinking about it, I've never touched any of the resistors to see if they get warm... I may have time later today or another day this week to try that out. I apologise for my lack of usefulness in your pursuit of troubleshooting the issue. I'm sure that Mads Barnkob will also give his input (eventually ), as he's pretty good about replying to everyone's posts. I ran across this thread today and noticed your substitution of 2N3904 for BC547. Did you, hopefully, catch that the pinout for these is different? 2N3904 is EBC and BC547 is CBE.